Many people say they don’t have the support to do performance measurement, that their leaders or colleagues don’t see the value in it. What you need to do is take a different tack, and hook into what your leaders and colleagues *do* see value in. Make it about fixing a problem, not measuring performance. Often those people you want support from, to start or improve your performance measurement, don’t give it enough importance and enough urgency. If you want people to take on an idea you truly believe is good and right for them, you have to make them aware of that importance and urgency. Performance measurement will not become relevant to them until they can appreciate its role in making their life easier. That’s why I suggest that you find a performance problem, and fix it using measurement as a tool. The problem could be one that your leaders and colleagues are already painfully aware of, or you may need to show it to them. Make them aware of the costs and consequences of the problem (something that measures can help you with), then fix the problem, using measures to monitor the results as well as any diagnostics. If you use PuMP, then you’ll be using a methodology that naturally blends with problem solving. 1. Which undesirable costs are rising? Generally people keep a keen eye on costs. And the data is easy to get, too. So take a look at it. Are there any cost categories that are showing increases when they shouldn’t be? You’ll need to extract the cost data for a couple of years, and plot them in a line chart until you find one that flags a problem. 2. Where is there too much wasted time? Wasted time is caused by rework or queueing or waiting. So where ever you see or hear people complaining about having to do things over again, or having too much work piling up, or having to wait for others to do their bit, you have a performance problem itching to be solved. 3. Where are people complaining they don’t have enough resources or budget or staff? Usually a cry for more money or more people is a sign that a process is inefficient. People won’t see it, but that’s more because they’re not used to looking at process design. Here you’re looking for processes that seem overly complex and have too many steps or approval points or red tape. 4. What is the number one complaint that customers make? Pareto analysis of your complaints data is a great place to start here. And if you don’t have any data on customer complaints, then just ask the poor souls who have to listen to those complaints. They’ll have a reasonable idea of the most common ones. 5. Which targets for financial measures are not being reached? This is a good one for helping people understand the relationship between financial and non-financial measures. Trace back a cause-effect chain from the financial target, to identify a causal factor that needs to be better. For revenue, it might be sales conversion rates. For profit, it might be throughput (the volume of outputs, such as order or deliveries or reports or services, that a process can produce in a given amount of time). If you manage to light a fire under your leaders and colleagues about fixing this performance problem, then of course make it a collaborative venture. But sometimes you’ll need to convince them a bit more strongly, or inspire them that the problem really can be fixed. Go ahead; play the hero! And make sure you document your journey as you travel through this problem-fixing, including how you developed and used measures. This way, you can share the story later and excite everyone with a new awareness of how to fix performance problems, and why measurement is so valuable. 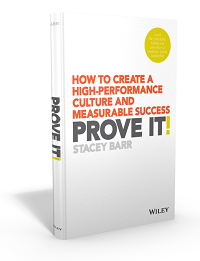 Find a performance problem worth fixing, and make it your own personalised case study to convince your colleagues of measurement’s true role, and indisputable value.